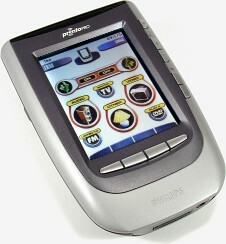 Take the original Pronto, add a color LCD display, more memory and additional hard buttons and you've got the ProntoPro! Since late 1999, speculation over Philips' color successor to the Pronto TS-1000 has flourished. Users, already enamored with the original black and white version's amazing potential, wondered what new ideas Philips would come up with to wow them. The reason for this early interest was quite simple: the Technicolor dreams shared by many owners, eager to create the ultimate interface to the ultimate electronics control device, had been beaten down into a mere monochromatic facsimile. A colorized version of the Pronto promised an end to this limitation. Just as laptops and PDAs eventually made their way to the world of color, so indeed would the ubiquitous remote control. Soon after the Pronto TS-1000 was released (read our full review here), it shared the newly created "graphical touchscreen remote" category spotlight with an aptly timed offering by Microsoft and their partners. While both products were more than capable of controlling a room full of home theater gear with ease, the Pronto began to develop an edge, honed chiefly by its open-ended architecture and unique ability to share setups among owners. 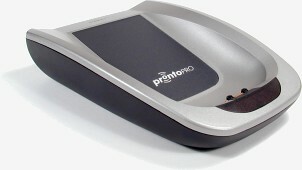 The Pronto's success could be traced back to the original development team who, possibly due to a foreshortened timetable, made the Pronto less proficient at home theater control out-of-the-box but, as a direct result, made it remarkably capable when paired with ProntoEdit, its free computer design software. Over the years that followed, the Pronto community was candid when it came to sharing their wants and desires with Philips. Who better to tell a company what they'd like than those who actually use the product? Some of these changes were incorporated into Philips' second-generation product, the Pronto TSU2000 (read our full review here), which offered more memory and a large preprogrammed code database. The remainder were believed left to be included in an entirely new product - namely, one with color. Although a number of companies already share the high-end market, such as Crestron, AMX and Lexicon, where a complete color tabletop system will run into thousands of dollars, a gaping hole remained between the low and high-end segments - both in price and product offerings. Philips, realizing that their Pronto already had appeal to those upmarket customers, has at long last come up with a proper response: the $999 USD MSRP color handheld Philips ProntoPro TSU6000. Philips' history on the original Pronto, combined with the fact that they are once again first into play with an entirely new product category, means that expectations are running quite high for the ProntoPro. Before we begin, it's important to stop thinking of the ProntoPro as "high end" - as one would the Pronto TSU2000. It is now more accurate to consider the remote as "entry level". Confused? Well, at more than double the cost of the original Pronto with charger, the ProntoPro has been elevated completely out of the general marketplace and into the luxury category. A league where the playing field is on an entirely different level -where price plays secondary role to customization and system automation capabilities. This certainly doesn't mean that the average consumer can't consider the ProntoPro as a "prosumer" alternative, but the remote itself is no longer considered "mainstream". Realizing this, has Philips done enough with the ProntoPro to make it a worthy contender for its new audience?